Jana’s having surgery. By the time this gets posted, she’ll be well into her recovery, demanding that treats be brought to her in bed, thumping her tail imperiously as her army waits on her. As a dog of a certain age who takes Rimadyl, Jana needs regular checkups. Her very thorough vet likes to get that “look around,” and has been tracking what turned out to be a small mass on Jana’s spleen. Luckily, Jana can live just fine without her spleen. Even more fortunate — additional tests show no sign of cancer anywhere else. 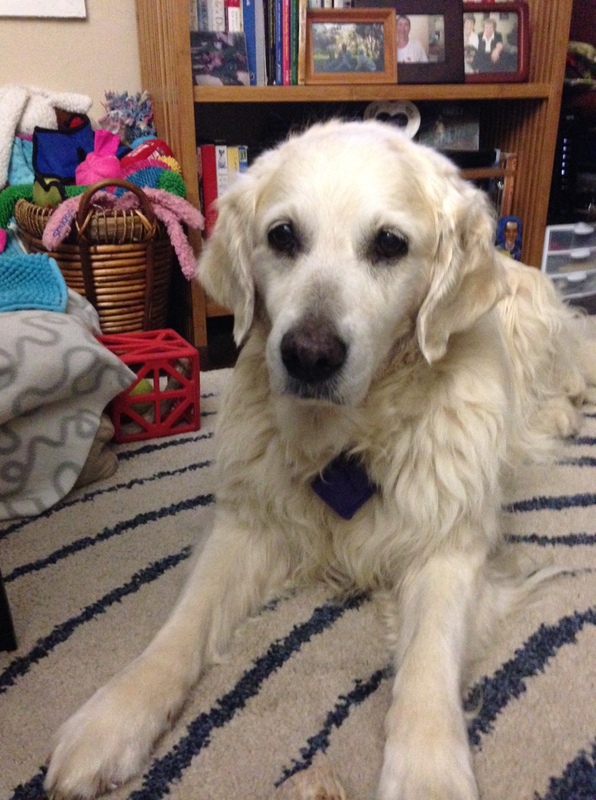 You see, because she’s a golden retriever, the most likely kind of cancer is hemangiosarcoma, which can spread quickly to the lungs, the heart, throughout the body. If the mass is cancer and if the had spread, the prognosis is very poor. So, no sign of spreading is very good news. The mass could also be benign. The problem with spleens, I am told, is that they are very delicate. Rupture can be fatal. A mass, an attempt to biopsy a mass, or an attempt to remove part of the spleen can all cause massive internal bleeding. So out it came in its entirety. If it’s not cancer, or it is cancer that hasn’t spread, Jana will be just fine. She’s enjoying the pampering that comes after the surgery; she enjoyed the beach day that came before the surgery even more! Jana’s recovery has been surprisingly smooth. She’s taking some pretty good pain drugs, but she’s not taking that many pills. She has been leaving her stitches alone, and was eager to go for a (very short) walk a couple of days post-op. She’s one tough cookie! Glad to hear positive news. My first golden had that and it was awful. Once diagnosed, it was not but a month that she passed. This this type of cancer is just way too common these days. Always enjoy your posts, Pam! !